Of course he does have a program for sale, but for a very reasonable amount you could find out if photography can be your hobby/avocation and your new half-time business. The books and the workshops are out there. Monetize your passion…. Do What You Love and the Money Will Follow …. Start Your Business Now ….. Making a Living Without a Job….. So how do you actually do this? Step 1: Brainstorm. Take a moment, or hours, or even days to write all your ideas down. Do not think about what will work and what might not work.. This is your brain storming session and you are allowed to write down whatever comes to mind. Turn your censor off. Step 2. Make a List. Take the list of ideas from your brain storming session and write each idea on a separate piece of paper or index card. Use as many cards as you need. Each idea should have its own card. Step 3: Categorize. Look at each of your ideas, and sort them out, put them in categories. Are any of them similar? Do some of them go naturally together so they all might be done within one business? 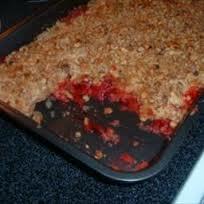 For example, you love to cook and you love to help people with dietary restraints find foods and recipes they can use. These two ideas would go in the same pile. The cards that state your love of doing stained glass and decorating your home for the holidays will go into separate piles. Step 4: Ask the Big Question – Does This Idea Fill a Need or Solve a Problem? So take each card and ask yourself, does this idea fill a need, or fix a problem? This is crucial. People buy when you can solve their problem or fix their pain. Now you may have to educate them that they are in pain or have a problem before they will buy. For your product or service to be successful, there has to be a perceived need. Step 5: Are You Qualified? On the back of the card make a list of your qualifications to sell or offer this service, and write down what you think the perceived problem or need is. Back to the food example, you have enjoyed cooking for family and community event for for 20 years, ok that qualifies you. You know that the local caterers will not cater to small events. Sounds like a niche for a mini-caterer. Step 6. Reality Check. Go back and look at each pile of cards. Are some of your answers weak? Are your stained glass pieces really that outstanding? Can you really see yourself decorating other people’s houses? Which two or three ideas are the best? These are the ones your should explore. Don’t throw out the other cards, though. They may be hobbies your can do in your spare time or interests that may eventually lead to another business. Step 7. Visualize Your Business. Can you picture what this business will look like? Make your visualization real. Try mind mapping. 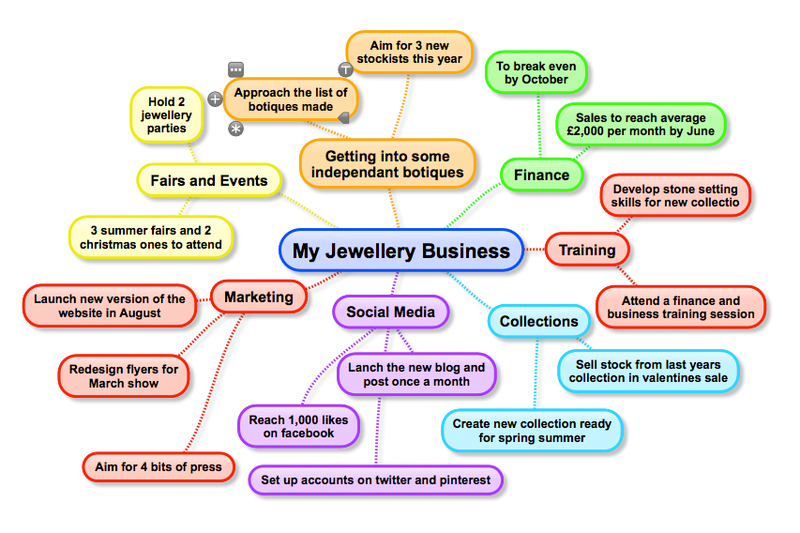 Here is an example for a Jewelry business and a how-to-mind map is at the bottom of this blog. If you are an auditory and visual learner, You Tube has plenty of how-to videos. Step 8. Research. 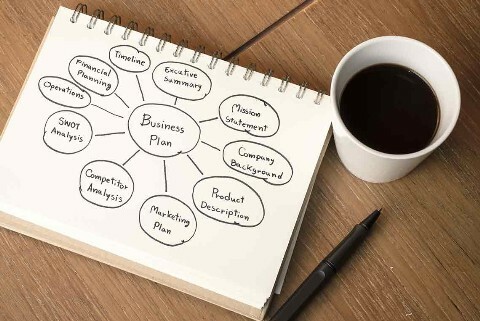 Now you may want to be more traditional and create a mini business plan. Your mind map may have given you a good idea as to whether or not you have a viable business. If not, here are some questions to ask yourself. Can you make money with this idea? How much could you potentially charge? How many clients would you need to support yourself and your business? If you are charging $10 vs $1,000 for a speaking session, you need many more appointments to make this work. Who would be your ideal client? Are there enough of these ideal clients to keep you in business? Will they be repeat clients, or once and done? This will mean you need to reach new ones every day. How will you reach these clients? Are you going to be paying for advertising or using word of mouth? Can you think of some overall expenses that will be associated with this business? The cook may need use of a commercial kitchen. You don’t need to come up with an exact budget, but a guess is helpful in determining if your idea will make a viable business. How long will it take before you start to see a profit, and a significant profit that will allow you to live? Step 9. Put Your Research into a Written Document. This document doesn’t need to be more than 2 pages but can be as many as you feel it needs to be to get your points addressed. Step 10. Get Some Unbiased Opinions. Let at least 3 people look at your mini plan. Ask them for honest feedback. This may be tough. Our ideas always seem great to us, after all we came up with them. Your spouse or best friend will probably not be able to give you an unbiased opinion. They may want to be supportive and be unable to tell you the flaws in your idea. Once you have this feedback you are ready to start your true business plan. You should look at all the feedback and determine which is the best business for you. If you have more than one business idea, start just one at a time. Starting a new business is time consuming and demanding. You need to focus on one. For most people trying to juggle more than one new business at a time is a ticket to Overwhelmed! One at a time is best. Ghoulish! Can you profit from some one’s death? 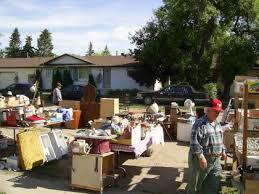 After someone dies their family is left with the accumulated possessions of a lifetime. After selecting the items that have particular meaning or value to them, they must find a way to sell the items so the house can be sold or the apartment cleaned out and rented. Usually they will hire an auction service to run an estate sale. This means that everything gets sold but some things will be sold very cheaply. So how can you make money? To get started, buy the cheap remains from the auction service directly or at a rummage sale they may have after the auction. Once you know the market and business well, you can approach families to buy the entire contents of the home of the deceased. Where do you sell what you have bought? Furniture is best sold locally, through consignment stores, Craigslist, or directly sold to used furniture stores. Items that are easy to ship can be profitably sold online. There are eBay sellers who have sold thousands of used items. To get started – attend a few estate sales and take notes on the asking prices and the sales prices at auctions. Look up identical items on Craigslist and eBay. With a little education, you can start buying and selling. Check out: www.auctionzip.com for a listing of auctioneers in every state. Another resource available as a book or for Kindle is Estate Sale Prospecting for Fun and Profit with Craigslist and eBay, by John Landahl. 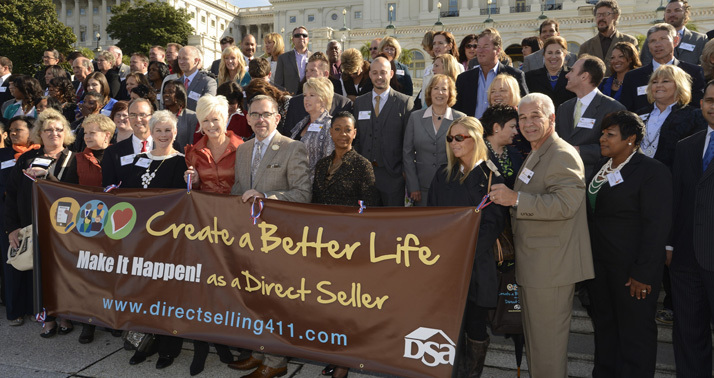 This is a business that can be started with very little money and done from home. Fear! Profit from people who are preparing for disaster! Surviving a disaster! More and more people are preparing themselves to survive natural disasters (hurricanes, floods, etc) as well as the end of civilization. This growing market is looking for survival kits, knives, preserved food, and information on making weapons in the wild, edible plants, and wilderness survival. So how can you make money? You have a number of options. You can sell survival supplies: preserved food, knives, water purifiers. If you are knowledgeable, you can arrange and present survival seminars or use your knowledge to create websites and blogs to provide information and then monetize your sites with affiliate product referrals or pay-per-click advertising. Producing e-books and paid newsletters will increase your sales and your traffic. To get started – an informational website or blog is the most inexpensive way to enter the survival market. Once you have some tips and have written some good articles, you can link to affiliate sites to earn commissions. If you want to sell supplies, before investing in a fully stocked web store or brick-and-mortar store, experiment with sales of items on eBay and other auction sites. Need to learn more about this market? In paperback or Kindle, there is How to Survive the End of the World as We Know it: Tactics, Techniques, and Technologies for Uncertain Times, by James Wesley Rawles. www.dollardays.com offers survival gear. Type “survival gear” in the “What do you want to search for?” box. OK, they are not quite as “In” as zombies and vampires but leeches sell for as much as $12.00 each or for as little as 20 cents each. First used in medicine 200 years ago and then abandoned as a form of treatment, the little blood sucking “vampires” are making a comeback. Leeches are used in microsurgery to reduce blood coagulation and to stimulate circulation in reattachment surgery. Since the anticoagulant hirudin found in leeches can’t be harvested efficiently, there is a market for medicinal leeches. The sale of medicinal leeches is new and there are many regulations. Most US hospitals buy their leeches from certified breeding facilities overseas. If you want to sell medicinal leeches, the way to go may be an importation and distribution business. www.leeches.biz is the website of a Canadian leech seller and has information on medicinal leeches. You can also sell leeches as fishing bait. Not as profitable but much less regulated. Learn how to trap leeches on YouTube. Search “leech trapping.” There are several good how-to-videos. Have some Halloween fun year round as a magician. It’s a fun, low-risk, business you can start part-time. 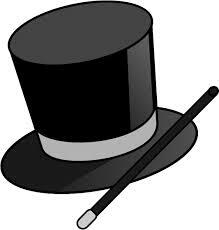 You can work at children’s parties, office parties in restaurants, or as a street magician. You can train yourself very inexpensively, buy some props and maybe a costume (don’t forget the hat) and begin by volunteering at a few parties. When you’re asked how much you charge, it is time to start booking the paying gigs. So keep the Spirit of Halloween throughout the year with a weird business that you can start on your weekends. So you love to cook. Can you turn it into a lucrative part time business? Catering for small events would be one idea, but it probably would be a great deal of work: food purchase and preparation, cooking, delivery, clean-up. But you can share your love of cooking and not have to do very much cooking. 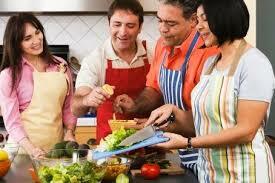 If you have a large kitchen or have use of a large kitchen you can offer cooking classes. If you plan ahead you can teach your cooking class in a night program for adults, here we call them “Night Life” and a variety of cooking classes are held at the vocational high school. Depending on the class, the cost of the class might range from $15.00 – $50.00. If you have expertise in some area of cooking: nutrition, weight loss, cooking for diabetics, great meals for folks on low sodium diets, gluten-free deserts …. You get the idea. You could teach classes or you could offer coaching or a tele-seminar series. Even if you have no specialty, just some really good recipes, you can become an author. Books can now be easily self-published. 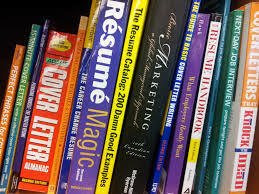 Sell your book at your classes. Teach a class based on your book. Offer a discount on the book to those who sign up for your next series of classes. Publishing a Kindle book will also establish you as an author. Offering a free cookbook with 10 or 20 recipes can be a way to build a list for your future coaching or tele-seminar business. 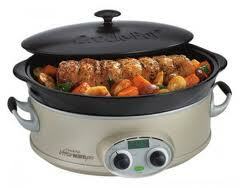 Or your business can just be selling Kindle cookbooks. When I last checked Amazon, most Kindle cookbooks were selling for $2.99. What kind of Kindle cookbooks were being sold? They seem to begin with cake mixes and then other “stuff” gets dumped in. 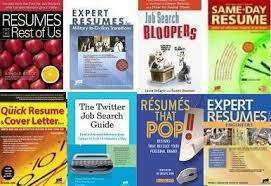 If these are not among your specialties with a little research, you could probably become an authority. Or become one of the first authors providing recipes for dump dinners. 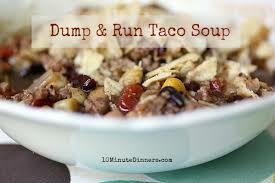 I think they used to be called soups and stews! You can publish both Kindle and print editions and you can increase the sales on your books by starting your own affiliate program so other people can earn money for promoting your book on their blogs and websites or recommending it to their social media fans or email subscribers. With an affiliate program you do not have to pay out until after the sale is made. Two companies that can help you set up an affiliate program are www.topwebcart.com and www.clickbank.com. Whichever you choose, you affiliate software will automatically calculate the commissions you owe each affiliate. Authors have credibility. And even though publishing a cookbook requires limited writing ability, you are an author! If you are comfortable with public speaking, you may want to seek out opportunities to be a guest speaker. 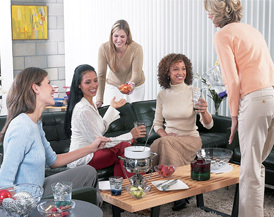 Consider groups who have monthly meetings and Meetup groups. After you give a talk or give a recipe demonstration, attendees will want to buy your book. Some Meetup groups charge admission and give their speaker half of the admission fees. If your name is known through your public speaking or through your sales and affiliate sales, it will be easier to offer more expensive cookbooks or programs like tele-seminars or coaching. 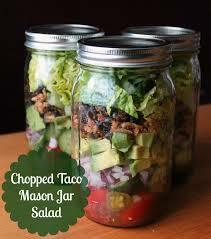 Share your passion for cooking profitably. If you are running an online business or a business that has an online presence, YouTube is one of the social media sites that you should be using, Why? is a community that like other social media has subscribers, friends, likes, comments, share, and views. makes it much easier to rank a high on YouTube with a video than on Google with a website. .Your YouTube video should provide high content information, which gives you professional authority. You do not need to star in your video. As long as potential customer either see or hear you, you will build rapport with potential customers. A music and picture video which is a series a pictures with accompanying music that is targeted to your niche. Keep in mind that your video should be non-promotional but that you can add the link to your website or squeeze page at the end of the video.